It's done! Admins now have the ability to grant unrestricted access to playlists when sending them to unregistered/not logged in users. All playlists can now be sent to any user, anywhere, anytime, and they'll be able to access the entire playlist regardless of the overall site access settings. Also, direct download links in the outgoing email body are now available as well. Your clients will be able to download a full zip folder containing the complete contents of the playlist without having to ever leave their email. 1. Click the "Email Link" icon next to the playlist you want to send. Notice the new checkboxes and URL at the bottom of the email overlay. 2. On the top line that begins with "Grant Access....", you can expire the link after a specific number of days of your choice or you can make it available forever. 3. On the second line you have the option to enable the direct file download links in the email body. 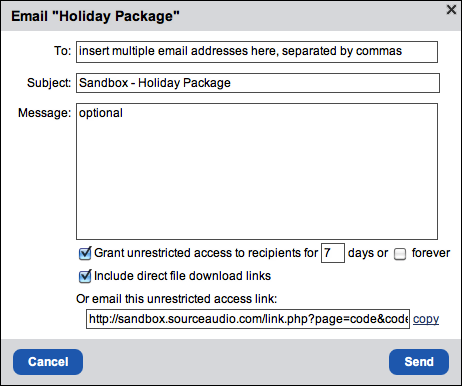 Please note that you have to send the email through your SourceAudio site in order for these links to be embedded in the email body. We can't control what's in the body of an outgoing email that's sent from another program. When your client receives the email message notifying them of the new playlist they can simply click the new download link in the email body that initiates the download instantly. Even if your site has Registration Required this new feature will work for all users. 4. Lastly, you can simply copy & paste the link at the bottom and send it to whomever you want to receive the playlist. All users, logged in or logged out, will be able to audition the playlist with this link. Feel free to send it from your email program of choice - just note that since some users won't be logged in and SourceAudio can't tell who you're sending it to from your own email program, your stats and reporting on the playlist will be slightly limited. We'll be able to track the number of opens and the logged in users who opened it. We'll know the IP address of non-logged in users who opened it as well. So, you'll get a really good picture of the activity on the playlist, you just won't have all of the names of the logged out users who accessed it. There it is! Your playlists can be sent to any user, logged in or logged out. So, start sending some playlists!